I have never found a better clamp, nor a cheaper one! An old idea that still works just fine! Every time I go to buy more clamps I look through all the new designs, play with them a little, and then find the old Pony brand pipe clamps, usually semi-hidden on a lower shelf. I have yet to find a clamp that works better than Pony's decades old design. If the pony clamps have a liability, it is their weight. These little wonders appear to have been designed decades ago and still are made from cast iron, probably in molds that are older than most of us. The black iron pipe to which hey are fitted certainly adds weight, but also provides unmatched rigidity, strength and durability. If there is a way to damage a Pony pipe clamp short of an acetylene torch, I have not found it. 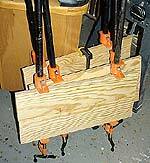 Most of the newer style clamps are considerably lighter, which could be a benefit in some types of glue-ups. So far in my woodworking I have encountered no situations that could not be handled by the Pony clamps. That time is probably coming, and I do anticipate adding some lightweight clamps to my inventory at some point. However, my trusty Pony clamps will always be close at hand.